I am going to do a little mini-series on Korean words starting with this post. If you are traveling to Seoul in September for FOSS4G Seoul, this may help a little. I am no Korean language expert (nor even fluent yet), so any corrections are welcome. Let’s start with the Korean word “bang”. 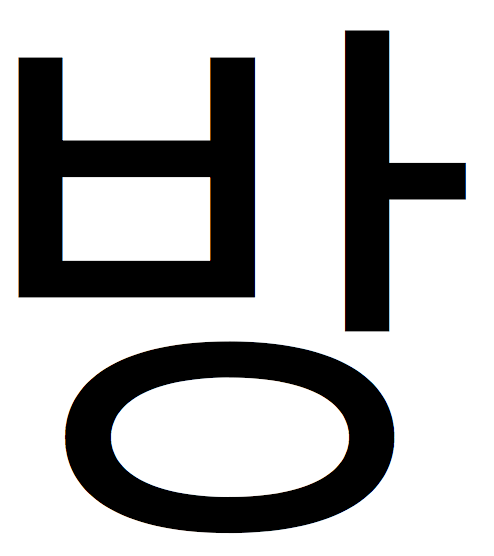 This is the romanized version of the Korean word 방, which is composed of three letters ㅂ, ㅏ, and ㅇ. If you are from the US Midwest like me, the “a” sound “ㅏ” is not nasal like some pronounce “angry”, but more an “ah” like “bah-humbug”. Sanghee Shin, CEO at Gaia3D and Representative of OSGeo Korean Chapter explained his motivations for leading Seoul’s bid to make Seoul the starting point of a FOSS4G big bang extending the FOSS4G throughout the region via this conference. Generally in English, we would see this as a single dimension of the word “bang” — referencing the cosmological term “big bang” to signify the rapidly expanding beginning of open source geospatial in South Korea. The “big bang” in Asia was referenced again in the video on FOSS4G Seoul shown at the end of FOSS4G North America. In that context, it was paired with Psy’s Gangnam Style horse dance, which perhaps made it a double entendre. But the meaning of the word “bang” in Korean is “room”. So “big bang” means “big room” or “big house”. It is often used similarly to how the word “house” is used in English. So sojubang is a pub (소주방 — a place that serves the Korean alcoholic drink soju) and norebang (노래방 literally song room) is a karaoke place. If you are going, I’ll see you at the big bang. I recommend we retire at the end of the day to the norebang.